It’s been over a month since my last update and a LOT has changed in that time. 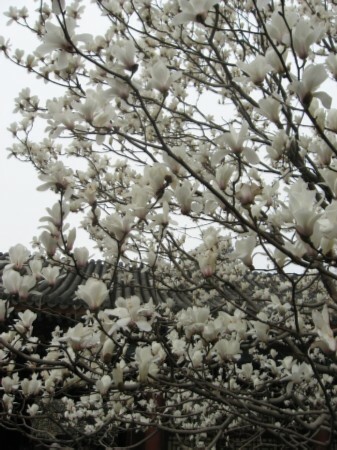 April is the one and only month of Spring we get in China so there are dramatic changes in weather and scenery. During April I… went to the Summer Palace for a digital camera scavenger hunt with some of the youth, got a hair cut (don’t worry, most of it’s still down to my waist), went to two youth camps, observed ANZAC Day at the Australian embassy, and began preparing to attend two weddings (October in Canada and January in Australia). Oh, and I moved to a new town and started a new job, so there’s that too. The youth camps were amazing! A lot of problems cropped up at the last minute (campsite cancelled with less than 3 weeks to go – right when I was moving, new place required original passports, hotel got nervous and local police came to see passports and interview a staff representative, extra people showed up and others didn’t show up at all – including leaders, no towels in rooms, rain, a bag with laptop and camp cash stolen and found again…) but none of this stopped it from being a very successful couple of camps. Numbers were down (140 people at High School and 220 at Middle School) but the kids got really involved and that made for a great atmosphere. Everything went well – the games, the music, the worship, the messages… There were also amazing brownies for dessert. It was a great experience for me to step back and be involved in camp in a different way. I did a little upfront stuff, a little behind the scenes stuff, and a little admin stuff – supporting rather than being in charge. It was also wonderful to share a cabin with some of my girls for the first time since my very first youth camp in November 2005. At one camp I actually got to stay with the three girls who were in my small group (the other two left for university last year) – I’m pretty sure they were all in my cabin at my first youth camp, too. It was WONDERFUL to be with them. It amuses me, though, that I’m supposedly the “adult” in that room. I’m the one eating junk food, staying up late, sleeping in, and talking about everything. They’re the calm, responsible ones! I led workshops at both camps which, again, I hadn’t done since my first youth camp here. I was pleasantly surprised by the turnout at my workshops, and absolutely blown away by the responses I received (from kids and leaders alike). I spoke on Hosea, probably my favourite book in the Bible, and how it speaks of God’s love and desire for REAL relationship with us, even though he sees us as we are (with all our faults – our stupidity and our rebellion). The feedback I received – both first and second hand – has really encouraged me that teaching the things I learn is an important ministry. It’s been a full month with a LOT of fun and exciting and rewarding moments. The biggest theme, however, has been adjustment. I am still struggling to find my feet in a totally new environment. I have started to form a new weekly routine and to settle into it, but I still feel quite isolated and uncertain. I am, however, completely certain that I am in the right place at the right time. I love where I am. I love what I’m learning. I just don’t feel completely comfortable yet. I’m trying to cut myself some slack – it takes more than a month to get comfortable in a new life! I’ve been in China over 4 years and although this is certainly not starting again, in a lot of small ways, it really is. In the midst of the feelings of isolation and uncertainty, however, there has been a constant stream of amazing connection. I have received some wonderful emails, from youth and friends in various countries. Two of my boys (one here and one back in Australia) asked if I would help edit some of their writing – which made me feel very loved (I love editing and I was so chuffed to be asked!) Due to no longer living in Beijing, I have had the chance to stay over with a few good friends when I’ve needed to be in town. I also had two of the girls stay over at my house, which was amazing. One of them lives in Langfang and comes to visit each week, and I have one other friend here who visits as well. It’s so relaxing for me to have people visit me at my place. In all honesty, there have been some truly awful days – but there have also been days where everything has fallen neatly into place, and I’ve gone from one thing to the next with perfect timing, receiving exactly what I’ve needed in exactly the right way. There’s more change ahead for me. A lot of people will be leaving town for good. A lot of my closest friends, including a lot of the youth I care so much about, and many of the youth leaders, are leaving. Now, with the changes to China’s visa regulations, even more of my close friends are facing the possibility of having to leave. Some days this feels terribly overwhelming – what will I do without all these people I love so much?? – but on other days it’s not so hard. I look at all the great things that have happened, the ways in which things have just worked out, and I can believe that everything else will work out, too. I have a clear sense that my life is unfolding exactly as it’s supposed to. I can’t see everything that’s coming up ahead, but it’s getting easier to not worry. I hope you’re all doing well, and I’d love to hear from you all! THEN: All the trees were bare, save a few blossoms. NOW: The flowers have come and gone, and all the trees have a generous covering of bright green leaves. THEN: I lived in Beijing (a territory all its own); a city of 15-20 million. NOW: I live in Hebei Province (187,700 km², population 68 million), in the “city” of Langfang (population 3.8 million). This makes it more a town than a city by Chinese standards. THEN: I lived in Wangjing (aka “Little Korea”) an area in the northeast of Beijing, the space between two ring roads and two expressways, full of high rise compounds. NOW: I live in “Oriental College Town” – a complex housing 30 universities with combined enrollment of 50,000 students. It’s going to be interesting (empty) in summer! THEN: I lived in a 2 bedroom apartment (85m²) on the 7th floor of a 25 floor building. NOW: I live in a 3 bedroom, 2 bathroom apartment (170m²) on the 4th floor of a 5 floor building. THEN: Rent was 3,500 RMB a month ($530). NOW: Rent is 1,500 RMB a month ($225). THEN: My housekeeper came 7.5 hours a week for 300 a month ($45). NOW: My housekeeper comes 15 hours a week for 300 a month ($45). THEN: I lived with the lovely Bec, and my two best friends in the city were conveniently located in the two nearest buildings. THEN: I worked for the BICF as the interim youth director (well, a month ago I had already done the handover to the new guy, but still). It was 40 hours a week, but in various places… at the office, at home, at schools, at youth events… Sometimes I didn’t start til afternoon, sometimes I was still working at midnight. Oh and I had Mondays off. Or I was supposed to take Mondays off. I also taught singing at home twice a week. NOW: 8:00am-5:00pm, Monday to Friday. THEN: When I actually went to the office, none of my workmates were Chinese. THEN: 95% of my work was totally in English. NOW: My work (both written and spoken) is about half-half English/Chinese and I am constantly switching between, or using them concurrently. NOW: I rarely go to bed after 11pm, and usually leave the house before 8am. THEN: I rarely ate breakfast, sometimes ate lunch, and usually ate dinner. NOW: I sometimes eat breakfast, always eat lunch, and usually eat dinner (a Chinese lunch is provided at the office – I’ve never eaten lunch so regularly since high school!). NOW: I eat western food once or twice a week. THEN: I went to ReGen (youth group) every Friday night. NOW: I go to ReGen every Friday night…. ← I have a new apartment!